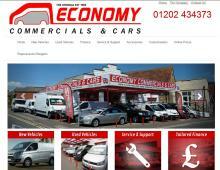 Economy Commercials are commercial vehicles specialists based in Bournemouth. Having a wide range of new and used commercial vans for sale means you can find the right model for your business needs. Economy Commercials also make it easy for you to afford your desired van or car with their tailored commercial vehicle finance. Van sales in Hampshire & Dorset are increasingly funded by special Van Finance offering 'Buy Now Pay Later' deals. Economy Commercials serve a large client base selling new & used vehicles across Dorset, Devon, Hampshire and Wiltshire. Their commercial vehicle offers are too good to miss!